The last blue hour version from this fine afternoon a Friday in March 2017 along the main street of Oslo: Karl Johans Gate. The stately Grand Hotel with the very famous and popular Grand Cafe at the corner vis a vis the Parliament building of Norway. Grand Hotel was founded in 1874 by the pastry chef Julius Fritzner. When it first opened, the block on Karl Johans gate consisted of three buildings: the Bardoe, the Fuhr and the Heiberg buildings. The latter, a three-story building at the corner of Rosenkrantz gate, was equipped as a hotel. Nicolay Fritzner bought the building, but his brother Julius ran the hotel. The Grand Café opened first. Architect Jacob Nordan was in charge of refurbishing the local, and Fritzner's good friend, Wilhelm Krogh, a specialist in theater and set decoration at Kristiania Theater, painted the interior. Originally, the café was above street level, with access from stairs on the outside of the building, but in the latter part of the 1870s, the floor was lowered and the entire venue was redecorated. 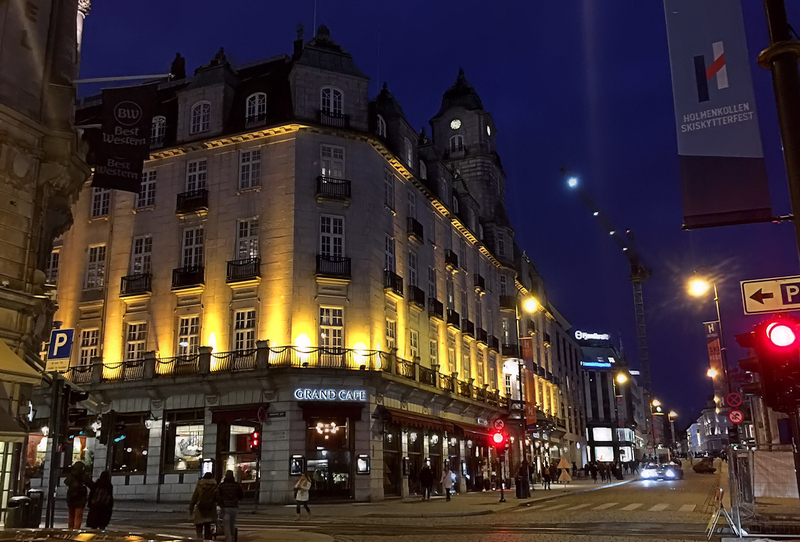 From that moment on, the Grand Café became the meeting place for all of Kristiania’s citizens. Professor Christen Heiberg's three-story building on the corner of Karl Johans gate 31 was one of a number of distinguished houses built around 1840 along the "New Palace Road", as Karl Johan was called in those days. Today it seems logical to open a hotel in this newly fashionable district, but that was not the case at the time. Many of Fritzner's contemporaries tried to discourage him from opening a hotel so far away from what was then the center of Kristiania.